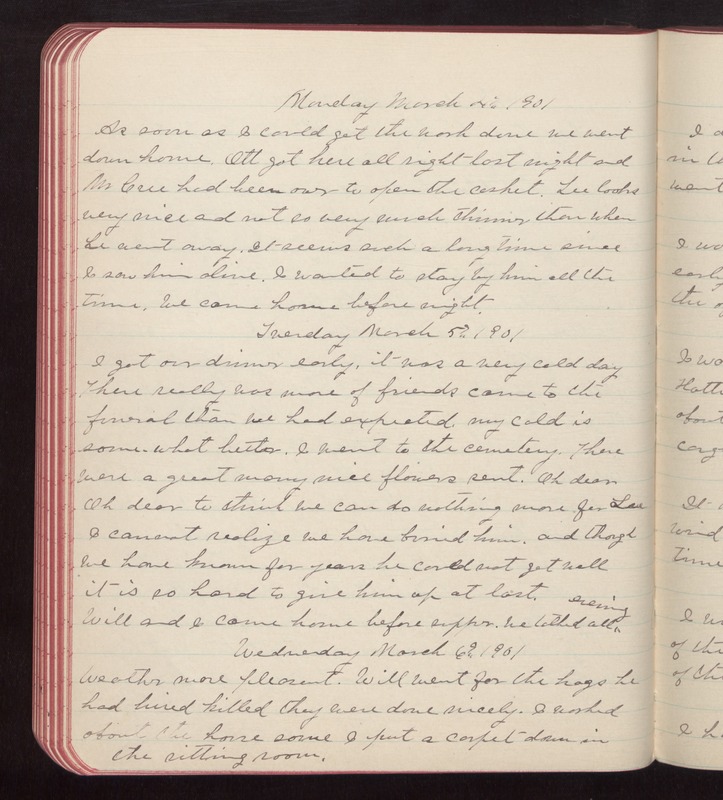 Monday March 4th 1901 As soon as I could get the work done we went down home. Ott got here all right last night and Mr Cree had been over to open the casket. Lee looks very nice and not so very much thinner than when he went away. It seems such a long time since I saw him alive. I wanted to stay by him all the time. We came home before night. Tuesday March 5th 1901 I got our dinner early, it was a very cold day There really was more of friends came to the funeral than we had expected. my cold is some-what better. I went to the cemetery. There were a great many nice flowers sent. Oh dear Oh dear to think we can do nothing more for Lee I cannot realize we have buried him, and though we have known for years he could not get well it is so hard to give him up at last. Will and I came home before supper. We talked all evening Wednesday March 6th 1901 Weather more pleasant. Will went for the hogs he had hired killed they were done nicely. I worked about the house some I put a carpet down in the sitting room.